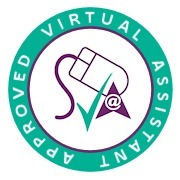 A Virtual Assistant (VA) is a self-employed professional assistant who offers administration support to small and medium-sized businesses, either on an hourly, project-by-project or regular ongoing basis. Most VA’s have many years of relevant experience under their belt in an office environment before going into business on a self-employed basis. Find out more about Roz’s career history and experience. Basically, a Virtual Assistant frees up your time and resources by taking on all your everyday administrative tasks, allowing you more time to focus on more important things like managing your business and looking after your customers. Find out more about all the benefits of using Virtually Roz. What sort of working relationship can you have with a Virtual Assistant? A good Virtual Assistant will get to know you, your business and your customers inside out. By developing a collaborative relationship with you, they can take on more and more responsibility for all aspects of your business administration, giving you even more time to grow and develop your business. What type of work can a Virtual Assistant do? As well as everyday secretarial and administration work, a Virtual Assistant can also take care of lots of the other routine tasks that often divert your attention and energy away from building your business and increasing your revenue. Find out more about the wide range of business services available from Virtually Roz. Can I afford a Virtual Assistant? Time is one of the most valuable commodities you have, and if you’re running a business, you’ll know it’s always in short supply. So the real question is: “Can you afford not to have a Virtual Assistant?” By using a Virtual Assistant to handle your everyday business tasks, you’re effectively buying back your own time to focus on all the more important things you need to do. Think how much more you could achieve if there were just a few extra hours in your day! And it needn’t cost the earth – check out the affordable, flexible rates available from Virtually Roz. Where do Virtual Assistants work? Virtual Assistants work at their own premises, often working from home. This means you get experienced and highly skilled business administration support without having to worry about office costs or any of the usual staff overheads. Virtually Roz is located in Nottingham, but as we work remotely, it really doesn’t matter where you’re based – we can always keep in regular contact via email, phone or Skype. What types of businesses use a Virtual Assistant? Basically any business that needs to save time and money can make life easier by using the services of a Virtual Assistant. For flexible resources when you need them, without the hassle of employing extra staff, Virtual Assistants are especially beneficial to small and medium-sized businesses. Virtually Roz already works for a wide variety of different businesses. What’s the difference between an employee and a Virtual Assistant? As independent self-employed professionals running their own business, Virtual Assistants aren’t paid a salary by their clients – they’re only paid when they’re needed, for the work they actually do. Also, with a Virtual Assistant there’s no need to worry about all the usual issues of employing staff like tax, national insurance, pensions, and sick/holiday pay. Find out more about all the benefits of using Virtually Roz. Do Virtual Assistants adhere to confidentiality agreements? Yes, of course! Virtual Assistants treat all sensitive company information and customer data with complete confidentiality, and should always be happy to sign a confidentiality agreement if you request this. For added peace of mind, Virtually Roz is also registered with the Information Commissioner’s Office under the Data Protection Act 1998 and conforms to the HMRC Money Laundering Regulations. How many hours work do I have to sign up for? There’s no minimum number of hours to sign up for – you’re totally free to use your Virtual Assistant for as few or as many hours as you wish. Many clients choose to give their Virtual Assistant one or two small jobs first, to check them out and make sure they’re up to scratch. Once you’re happy with the service level provided, and get a better understanding of how much work you can outsource to your Virtual Assistant, it’s usually more economical to opt for a reduced rate retainer package. Check out the affordable, flexible rate options available from Virtually Roz. Will hiring a Virtual Assistant work for me? Are you open to new ideas and new ways of doing things? Are you happy communicating via email and/or instant messaging? Are you prepared to delegate tasks with minimum supervision? Are you prepared to be available to answer questions, especially in the early days? If you can answer ‘yes’ to all these, taking on a Virtual Assistant could be a great move for you! Contact Virtually Roz today for a free initial consultation to find out more. How do I know a Virtual Assistant will do a good job for me? As a self-employed business person in their own right, a Virtual Assistant knows that client satisfaction is crucial, so you can always be sure of reliable, efficient service. At Virtually Roz, we take care of your business needs as if they were our own – quite simply, OUR business is helping YOUR business to succeed! How do Virtual Assistants keep track of the time they spend on their clients’ work? To ensure all work is timed and clients are charged correctly, most Virtual Assistants use electronic time tracking programmes. Virtually Roz uses the latest Paymo system, with real time reporting and the ability to track timings separately for different projects if required. Why not sign up for our regular e-newsletter?